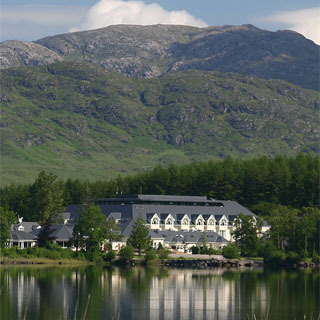 While on holidays in Donegal, Jody Gysling had occasion to visit Lough Eske. Here he found a little piece of Switzerland hidden away in the Hills of Donegal. The attraction of the snow capped Blue Stack Mountains was complimented by the friendly people and soon Jody was to make this wee corner of Ireland his home. Jody bought an old cottage from two brothers by the name of Harvey. Escaping the pressures of a hectic life in Switzerland, Jody decided to stay in Ireland and build a small guest house. He started out with four rooms and in 1989, Harvey’s Point was opened to the public with twenty bedrooms and two restaurants. At this time his brother, Marc had joined him in his crazy dream. Just before the hotel opened, Jody offered a young local girl called Deirdre a job for the summer. And what a long summer it was! Romance blossomed between Marc and Deirdre and together with Jody, they developed the business. Every year, there was reinvestment in the hotel. A new ballroom was added, the restaurant was extended and a second function room was built. Business grew from strength to strength and Harvey’s Point became renowned for excellent cuisine and a warm Irish welcome in a truly special location. 2005 has seen a major development in the ongoing success story of Harvey’s Point with the addition of forty new deluxe bedrooms and suites and an elegant new reception. Jody has finally created a Dream Hotel. His great talent for building and his unique vision for business have merged to develop the Harvey’s Point of today that we all know and love. On behalf of The Gysling Family and the Harvey’s Point Team, it is our collective Vision that Harvey’s Point will become the best hotel in the Northwest and one of the leading hotels in Ireland. It is our vision that the Harvey’s Point brand name will be synonymous with world class excellence in accommodation, food and customer service. At the heart of every good business, there is a dedicated team who co-ordinate all the elements of the hotel and drive continuous improvement. Some work behind the scenes, some work front of house, but all are commited to excellence in customer care and standards. It will be our pleasure to welcome you to Harvey's Point. From Donegal Town go in the direction of Killybegs. At the edge of town, take first right at the signpost for Lough Eske and Harvey's Point. Vouchers for all Harveys Point gifts will be posted free of charge.